Dental implants are now regarded as the number one option for replacing missing or failing teeth. Dental implants can be used to replace single and multiple teeth and in some cases, all the teeth. Loose dentures can also be stabilised and improved by the use of dental implants. 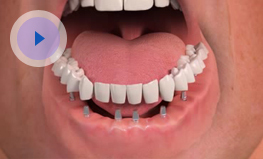 In many cases patients can use implants to completely dispense with their dentures. The dental implant team in Glasgow is led by Dr Stephen Jacobs. Dr Jacobs has been placing dental implants for over 20 years and is regarded as a leader in the field. Patients travel from all over Scotland for dental implants in Glasgow, to receive treatment at the safe and experienced hands of Dr Jacobs. He also lectures throughout Europe on dental implants, is on the editorial board of two implant journals, has published many articles and is a highly acclaimed teacher and educator. The implants are actually small titanium posts that are secured into a patient’s jawbone where they are missing teeth. Once secured, the bone gradually bonds with the titanium posts thereby providing a very secure foundation for artificial teeth. The dental implant process involves getting a 3D scan to understand where the titanium post can be secured. Once identified the post is secured into the jawbone. Once the healing process begins the jaw bonds with the post to provide a powerful artificial tooth root. After this Dental FX can secure a dental crown, bridge or denture to the implant to create natural looking tooth or indeed teeth. Are Dental Implants suitable for you? The good news is that almost anyone with a missing tooth is potentially suitable for dental implants. That said while there is no upper limit they are not ideal for children as their dental and facial bones are still in growth. So if you are considering dental implants in Glasgow then get in touch and we will be delighted to book you in for a consultation with Dr Jacobs. They are the next best thing to natural teeth. A dental implant is stable and strong so that it functions, feels and looks natural. They help retain the natural shape of your face and smile. A face without teeth can sometimes sag. Dental implants help maintain natural support and therefore your smile. Keep your teeth in your face – not a glass! Dental implants allow you to keep teeth in your mouth and therefore we help keep Glasgow and Scotland smiling! Design to last. Some traditional dental bridges assuming they are well properly maintained will last for up to 10 years. Whereas dental implants can last a lifetime if properly cared for.